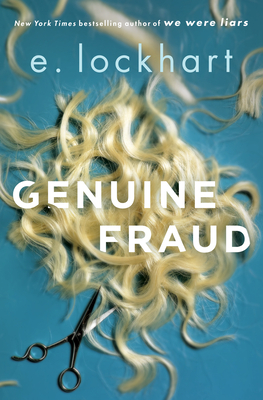 Genuine Fraud (Hardcover) | Copperfield’s Books Inc.
From the author of We Were Liars, which John Green called "utterly unforgettable," comes a mind-bending, New York Times bestselling thriller told in reverse. Imogen lives at the Playa Grande Resort in Cabo San Lucas, Mexico. She spends her days working out in the hotel gym and telling other guests how she was forced out of Stanford. But Imogen isn't really Imogen. She's Jule. And she's on the run from something. Or someone. Which means . . . where is the real Imogen? Rewind: Jule and Imogen are the closest of friends. Obsessed with each other, even. Imogen is an orphan, an heiress; she and Jule spend a summer together in a house on Martha's Vineyard, sharing secrets they'd never reveal to another soul. But that was months ago. Where is Immie now? And why is Jule using her name? E. Lockhart wrote the New York Times bestseller We Were Liars, which is also available in a deluxe edition. Her other books include Fly on the Wall, Dramarama, The Disreputable History of Frankie Landau-Banks, and the Ruby Oliver Quartet, which includes The Boyfriend List, The Boy Book, The Treasure Map of Boys, and Real Live Boyfriends. Visit her online at emilylockhart.com, and follow @elockhart on Twitter.